An increasingly wide range of patients of different age, ethnicity and social background often combined with other clinical conditions such as diabetes, cardiovascular disease or osteoporosis now find themselves battling against obesity and many health professionals become frustrated, feeling ill-equipped to handle each unique case with the one-size-fits-all approach offered by the "eat less, exercise more" mantra. Weight Management: A Practitioner's Guide explains how effective evidence-based programmes structured in a manner addressing the key components of diet and physical activity integrated with a behavioural approach could offer the solution to the obesity epidemic. 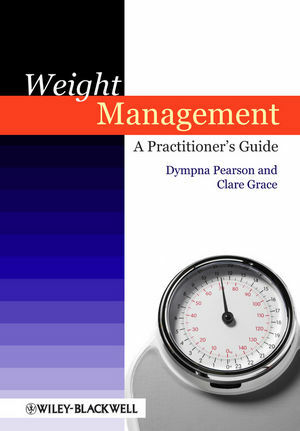 This exciting new book from renowned experts Dympna Pearson and Clare Grace provides practitioners and those studying to become practitioners and public health professionals with a much needed modern guide that clearly presents the latest evidence underpinning treatments and uses a step-wise approach to implementing programmes and building skills and confidence. Written with the express needs of practitioners and related health professionals at its core, this book will be a ready reference for those working in both acute and community settings throughout the different and demanding stages of the weight management process. This important book bridges the gap between behaviour change theory and the treatments that research has been shown to be effective. It aims to demonstrate how behavioural approaches can be embedded within practice to encourage patient empowerment and active decision-making. It’s major strengths are the breadth and depth of material presented, the engaging conversational style of writing and the huge number of resources and tools included. Written by two well known and respected practitioners in the field of weight management, it benefits from their academic, clinical and training expertise. It is different from other books in this area because of the experience of the authors - this gives the book a practical element often missing from more theoretical publications. Progression throughout the book is logical. Section 1 starts with setting the scene (obesity prevalence, causes & consequences). Healthcare professionals’ attitudes towards obesity and the potential effects of these upon patients are explored and the evidence for treatment options presented. Section 2 is devoted to practical application of the evidence, and how behavioural theory can be embedded in practice. It moves sequentially through prevention, assessment, finding and implementing solutions & maintaining change. Additional sections include the use of brief contacts, evaluation of individual weight management interventions and common challenges and misconceptions. The role of the healthcare professional is clarified at every stage of the consultation, and although the authors recognise the many difficulties that exist in weight management, they suggest how to incorporate best practice within realistic constraints. Structure and clarity are emphasised throughout. For anyone with an interest in weight management this is a great read. Written in an engaging style, it breaks complex ideas and theories into more accessible ‘chunks’, and concrete examples of using behavioural approaches are given throughout to illustrate how theory can be embedded into practice. For those involved in weight management it is a must. Behaviour change is recognised as central to effective weight management and the practical applications of theory throughout are invaluable. However the authors are careful to emphasise that training is needed – reading this book will not equate to effectively facilitating behaviour change in others. Anyone who has already undertaken behaviour change training will find in this book a useful tool to help embed the training, and for those thinking of doing the training it puts the current thinking and evidence into context. For the public health practitioner or those commissioning weight management services, this book helps to clarify and pull together evidence on what treatments and approaches have been shown to be effective, and to increase understanding of what should be included in commissioned services. The useful and comprehensive chapter on evaluation of individual weight management services gives examples of evaluation at different stages of interventions and what can be measured for each, emphasising the importance of considering evaluation from the beginning of the planning process. In addition the emphasis throughout on evidence-based practice clarifies treatments shown to be effective. All in all this is a great addition to the published work on weight management, written by practitioners uniquely equipped to do so. It is good value for money and thoroughly recommended. Hilda Mulrooney has served as a Committee member of domUK with both Clare Grace and Dympna Pearson, and has worked with Dympna Pearson in LNDS in the past. In addition she facilitates regularly on Behaviour Training courses run by Dympna Pearson.